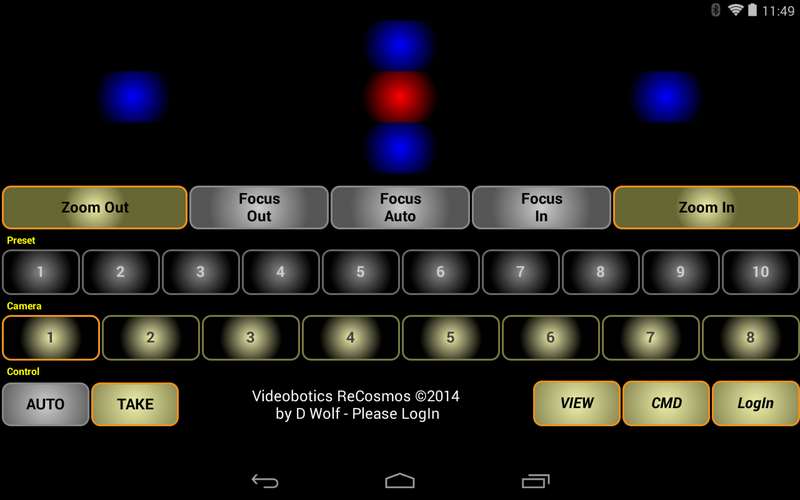 Full info on Cosmos Multi-Camera systems with video switcher, displays, titling, and more. Cosmos/CamMotion is, quite simply, the most complete and powerful robotic camera PTZ control software available. We've been making and continuously improving these packages since 1999. We include a direct GUI-based control panel for control from your PC as well as (optionally) a stand-alone network-remote control panel and info to let you create your own custom cotnrols. New ReXCAM Version 5 included (with keyboard commands, numerical position feedback, and other improvements) with (optionally) network-remote software versions. CamMotion and Cosmos network-enabled camera control software versions for PC are available with many popular cameras or is priced separately. The picture-links at the top of our web pages take you to full product information for versions designed for a variety of popular cameras, switchers, and PTU devices listed above. Compatible with all streaming and net-media tools. 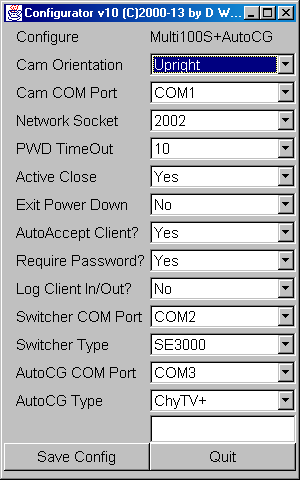 This screen shot example (above) shows the menu-based one-time Configurator, in this case for a Cosmos system with EVI-H100S cameras with AutoCG option. Just click the thumbnail to see it full-size. User-definable scripts can also be invoked remotely! Keyboard shortcuts can be programmed into your Contour ShuttlePro jog/shuttle device! 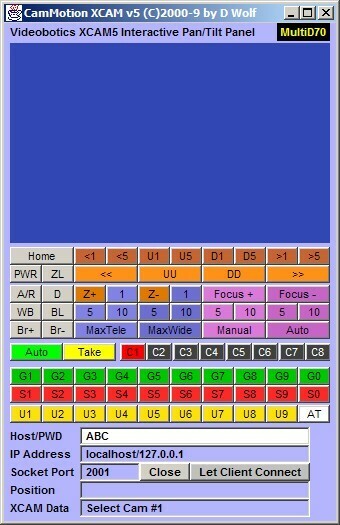 This first screen shot example (above) is our classic Cosmos compact GUI layout, in this case showing the version for EVI-D70 cameras. Just click the thumbnail to see it full-size. This second screen shot example is our new wide-screen Cosmos GUI layout, showing the newest version for EVI-H100S cameras and optional AutoCG controls. Just click on the thumbnail to see it full-size. All Cosmos systems permit the GUI display in either orientation - compact for small screens or wide mode for larger and hi-def displays. Keyboard shortcuts can be programmed into your Contour ShuttlePro jog/shuttle device - you can operate CamMotion or Cosmos systems using the ShuttlePro and other control devices from anywhere in the world. 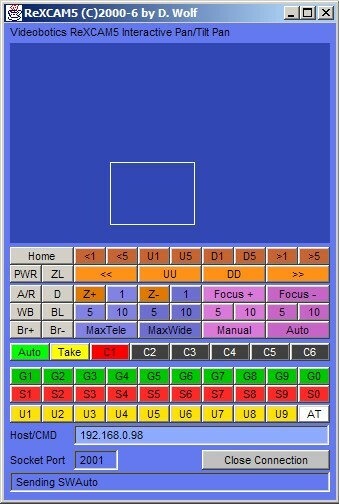 This first screen shot example (above) is our classic ReXCAM compact GUI layout. Just click the thumbnail to see it full-size. This second screen shot example is our new wide-screen GUI layout for ReXCAM, in this case showing optional AutoCG controls. Just click on the thumbnail to see it full-size. All network-enabled Cosmos systems permit the ReXCAM GUI display in either orientation - compact for small screens or wide mode for larger and hi-def displays. And don't forget our newest technogical innovation: complete ReXCAM (network and LAN-remote operation) capability on several popular Android tablets and even phones. Just click on the thumbnail to see more info on our Android touchpad tablet/phone control panels for network-enabled CamMotion and Cosmos systems. Complete programmability for designing your own network interface (you may program your own remote controls in Basic, Rebol, Java Applications, Applets, and/or Servlets, C++, etc. using our simple command sets that are the same for all cameras, see below). Thank you for visiting the Videobotics CamMotion & Cosmos Software Information Page.